Here's a splash of retro Cycle Chic. Thanks to Adam for sending it along. It's an advert, believe it or not, for Union Carbide and it featured in the New Yorker Magazine in the 1970's. On the left... pure Cycle Chic brilliance. Heels and a hat [see, Lynn? :-)] on a retro bicycle. Fantastic shot. These kind of photos gave me warm and fuzzy feelings growing up in the late 70's - early 80's. On the right, a dry text for a chemical and polymer company. Snore. I'm guessing that the advert dates from after the oil crisis in the 1970's, based on the text. They boldly claim that "If we succeed, there will never be another energy crisis..."
Um. Somebody didn't succeed. As I'm sure the citizens of Bhopal, India, can attest to, among others. But the photo is great and, in the text, at least they say "something as basic as bicycling". Which is right on target. All you need is a bike. Not much else. Cork City Council, in Ireland, put on a Cycle Chic Fashion Show a couple of weeks back and have now released a film. 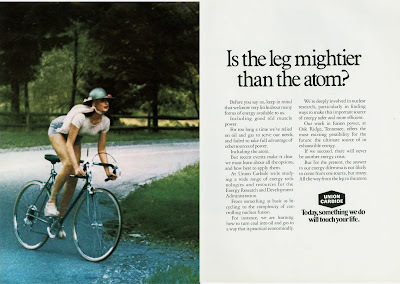 It's a bit long, but I think they've done well to sell cycling as effortless and stylish. The CYCLE CHIC Fashion Show reflected the spirit of the streets of Copenhagen, Amsterdam and Paris where cycling does not include wearing gawky reflective jackets and unattractive helmets. The CYCLE CHIC Fashion Show aimed to persuade people that cycling can be trendy. They have a gallery of photos on their website here. The show was sponsored by, among others, Trendy Travel. A European project to promote sustainable travel. Now that's a practical helmet - ideal for keeping the rain off. I'd place the ad somewhere between 1973 and 1979. Nuclear may well be a sensible choice for carbon emissions reasons (no, I'm not flame baiting here. So please don't treat it as such), but everyone went very quiet about it after Three Mile Island in '79. Then just when the dust / fallout had settled & proponents were thinking it was time to start banging the drum again, Chernoble went bang. I would only point out that it isn't retro. It is actually cutting edge; but old. Retro means backwards; which can only be done from a forward position. A 2005 Ford Mustang is retro. A 1965 Mustang is vintage. I travelled from Dublin to Cork to see the Cycle Chic show. A few of the outfits may not have been the most bike-friendly - as has been said by a few female friends when I showed them my photos (and note how many models are walking their bikes in the video) - but by and large it was a great idea and a big step in the right direction. Congratulations to Cork City Council for getting behind it and to all involved for their efforts. Siobhán- in 20 years cycling in Dublin, I've never heard that line. "Maybe one day you'll be rich enough to own a car" is the worst (and most typically Celtic Tiger-ish) thing I've encountered verbally- said to me, incidentally, by an overweight, stressed out motorist who was stuck in a long line of rush hour traffic, with whom I had a disagreement over his right (non-existent) to drive in a mandatory cycle lane. I cycled off casually, and left him to sit in his stationery, fume-filled machine... feeling rich. Union Carbide had a place down the road from me where I grew up. They would throw us out of the woods where we built trails and jumps. All in all a great photo. every outfit is cycle friendly. you see it every single day here in Copenhagen. those models perhaps weren't as used to it as Copenhagen women, but there are no clothes that you can't cycle in. Oh, don't mind me; I've been busy being annoyed lately at people who say "recycled" when what they really mean is "used," and you may have just caught a bit of the shrapnel. By far the most controversial thing that the American magazine Bicycling ever published. They got thousands of letters (remember those?) complaining: that it was sexist, of course (only ugly women who don't care about their appearance are allowed to rides bikes in America; or something), But mostly because - are you ready for it? It would be impossible to actually ride the bike in that outfit. Me? It just made me want to invite her on a club ride - and draft a lot. Perhaps I was just a teenage sexist pig; but I don't think so. I think the real reason was because she was hot and stylin' and that there's nothing wrong with that. It also would have made my day when she beat a few of the "serious" cyclists to the top of a hill in Nancy Sinatra (remember her?) boots it was "impossible" to ride in. Dudes, you push down on the pedal things and the wheel things go around. Cycling really is that simple. No but there are some clothes that just should never be worn under any circumstance. Although, the bikes do make them look better. Hmm, that hat just isn't doing it for me. Unless I was heading off to the Kentucky Derby, maybe. Love the shoes, though! Bicycles in the Kentucky Derby! Instead of cross dressing cyclocross, we could all dress in big hats and crinolines or morning coats and top hats and race around on Penny Farthings. That would be amazing. Z- I chose my words carefully: 'A FEW of the outfits MAY NOT have been THE MOST bike-friendly', which is quite different from not being cycle-friendly at all. I mean, I watched as a model in evening wear attempted to dismount from a beach-cruiser, with real difficulty. Wrong outfit? Wrong bike? Wrong model? No- poor *combination*. What I'm saying is, I don't know many women who would be comfortable giving the world an uninterrupted view of their underwear, regardless of how dedicated they might be to the cause of ordinary cycling. Y'know, it's possible to go to bed in a full body wetsuit, or to go scuba-diving in your pyjamas too. If one is trying to normalise cycling for the uninitiated - as I understood was the point of the fashion show (and this blog) - then dressing the models up in micro-minis seem (to me) to miss the point just a little. Certainly, from speaking to some women friends about it - the people who would actually have to wear the stuff, not just admire it - that was their opinion too: "Wow! Looks great! But it's not exactly practical, is it...?" Robert, (and I think Z can testify to it too), these models haven't trained their mini-riding-skills like Dutch and Danish women have. Perhaps, then, it's a case of running before we're walking? I've been a keen reader of Mikael's blogs (this one and CPHize) almost since the beginning - and I sometimes visit yours too ;) - and I've cycled in Copenhagen, Amsterdam (winter *and* summer, thanks), Munich, Berlin, New York, London, Edinburgh... so, y'know, the message is clear. We're all *ad idem* regarding 'the cause'. It may well be the case that micro-minis are cycleable (cycle-*friendly*? Hmmm...), but I return to the opening line of this post- it is necessary to learn to walk before one can run. By including some of the shorter outfits in the fashion show, I fear that the message might be lost; worse, that such outfits/images might actually be counter-productive. I didn't want this to turn into a rant (too late? ), but equally I think it is necessary to acknowledge the challenges that face cities / countries where the mode split for cycling hovers around the 2% mark, and to tailor the solutions accordingly. The brainwashing starts early here (US) when it comes to clothing "appropriate" for riding a bike. My daughter rode her bike to school on Dress Up Day last spring wearing her favorite flouncy knee-length skirt and strappy high-heeled sandals. After school, one of her friends wanted to try her bike, but thought she couldn't because she was wearing a dress. My daughter simply said, "Look at me!" So the girl hopped on and took a spin around the playground with no problem. Most children are also taught that it's dangerous to ride a bike wearing flip-flops. We both wore flip-flops all summer, and the only mishap occurred when my daughter was riding with her 2 boy cousins and one of her flip-flops fell off. When she stopped to put it back on, one boy was annoyed that she blocked his path and said to her, "That's why you shouldn't wear flip-flops on a bike - it's dangerous!" Boy, was she mad then. I just smiled and figured his sweaty feet must be making him irritable. "Dudes, you push down on the pedal things and the wheel things go around. Cycling really is that simple."